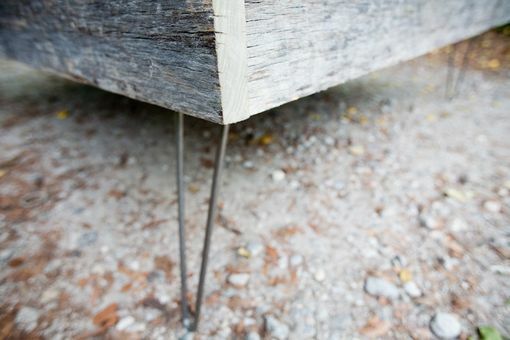 We call this the Robin Bed, and we think that it redefines the barnwood bed. 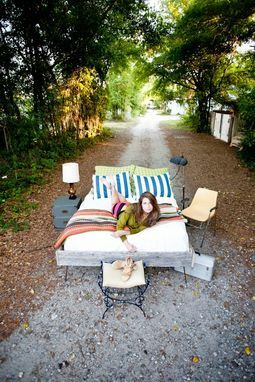 This bed is made from reclaimed poplar barn siding from a barn in rural North Carolina. It fits together in a simple case that encloses the mattress with approximately 1.5" inches of clearance for bedding on each side. You will see nail holes and scuffs which are original to the wood and its purpose. The bed is supported by four raw steel hairpin legs (shown at a standard 14" height) that offer a minimalist, industrial appeal. One additional leg is hidden underneath in the very center of the bed to offer increased structural integrity. The inside of the barnwood is upholstered in a gray damask to prevent nasty splinters while tucking in the covers. The bed comes complete with two sets of webbed slats that roll up for easy packing and mobility. The bed packs flat for easier, more affordable shipping. Bed is labeled for assembly, but you will need two adults and a screwdriver for the operation. Bed shown here is a queen but can be ordered in any size: twin, full, queen, and king. Listing is for a full or queen bed – be sure to specify the size needed at the time you place your order. Please contact us if you need a separate listing for a different size bed. Also, additional barnwood can be attached to bed brackets for a type of headboard, if you are interested in this detail, please contact us. There will be a $300 charge for this addition. Pillow shams pictured are also available in a separate listing.